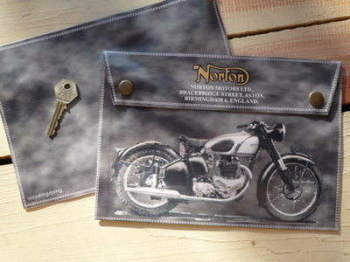 Norton - I Say Ding Dong Shop - Buy Stickers, Decals & Unique Automobilia. Castrol Wins Spanish Grand Prix on Nortons Art Banner. Special Offer to Clear. 22" x 26". Catalina Grand Prix Sticker. 2.5". Catalina Grand Prix Sticker. Black & Beige or Black & White. 3". 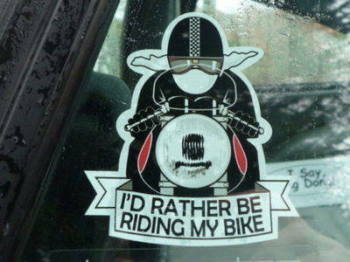 Classic Motorcycle Laser Cut Self Adhesive Badge. 2". Girling Gas Shocks Black & Silver Break Style Stickers. 2". Set of 4. Girling Gas Shocks Yellow & Blue Break Style Stickers. 2". Set of 4. H. L. Daniell Forest Hill Norton Motorcycle Dealers Sticker. 2". 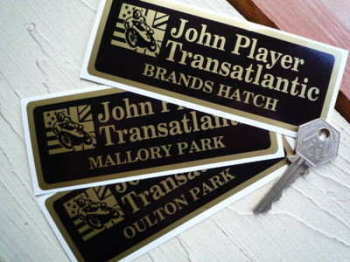 John Player Transatlantic Circuit Sticker. 5.25". LYTA Aluminium Cafe Racer Petrol/Gas Tank Oval Sticker. Various Colours. 50mm. Maximum & Minimum Oil Level White on Clear Indicator Stickers. 3.5" Pair. Maximum Oil Level Indicator Chrome Style Stickers. 3.5" Pair. 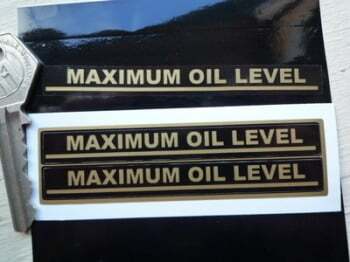 Maximum Oil Level Indicator Stickers. 3.5" Pair. 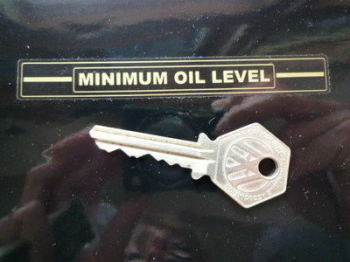 Minimum Oil Level Indicator Stickers. 3.5" Pair. 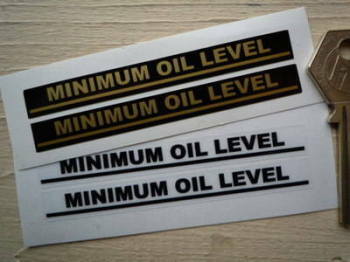 Minimum Oil Level Outlined Indicator Stickers. 3.5" Pair. Negative Earth Gold on Clear Sticker. 1.75". 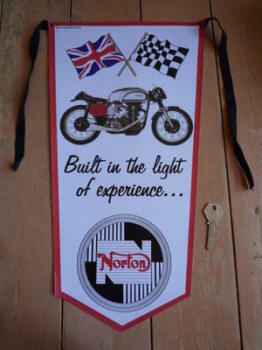 Norton & Castrol Shield Style Sticker. 3" or 4". 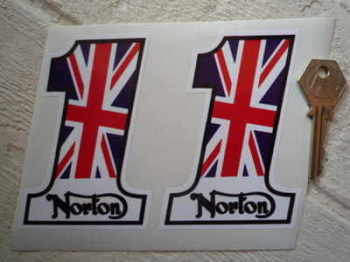 Norton '1' Stickers. 4" Pair. 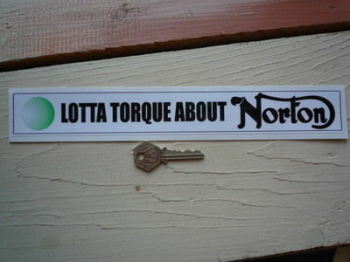 Norton 'Lotta Torque About' Sticker. 12". 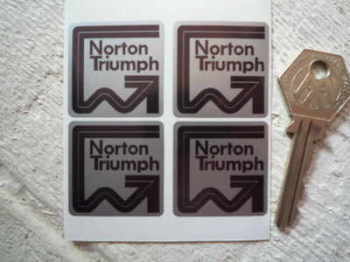 Norton Black & Silver Stickers. Set of 4. 1.25". 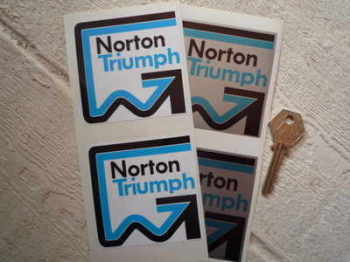 Norton Blue Style Stickers. 3" Pair. 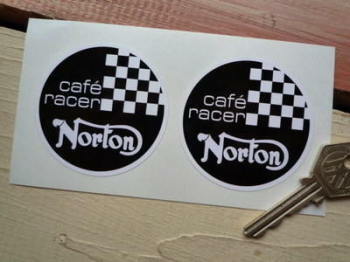 Norton Cafe Racer Circular Stickers. 60mm Pair.